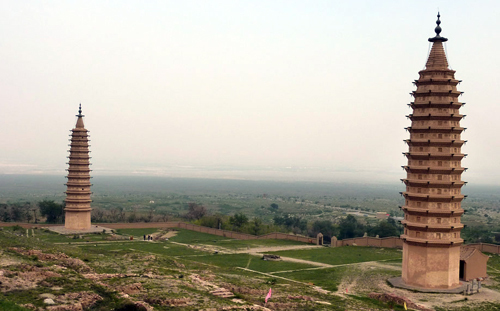 Nearby, about 9 kms further down the road, are two very well preserved pagodas, 13 and 14 storeys high and dating from the middle or late periods of Western Xia. They are best visited in the late afternoon when they stand out impressively against the stony backdrop of the Helan shan mountains. Both pagodas have small shrines inside, where people still come and worship. When we were there, a Chinese family were helping their aged grandfather to get around the shrines. It’s quite easy to enter the ground floor of the smaller pagoda and stare up into its hollow interior, while the tunnel leading into the taller pagoda is quite claustrophobic. In a small temple behind the pagodas, a Buddhist monk will tell you your future and reveal all your strengths and weaknesses; for a (substantial) donation of course. 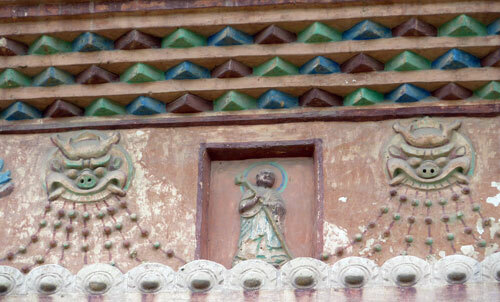 The pagodas seem to have similar opening hours to nearby Helanshan Yanhua (8.00 – 18.00). 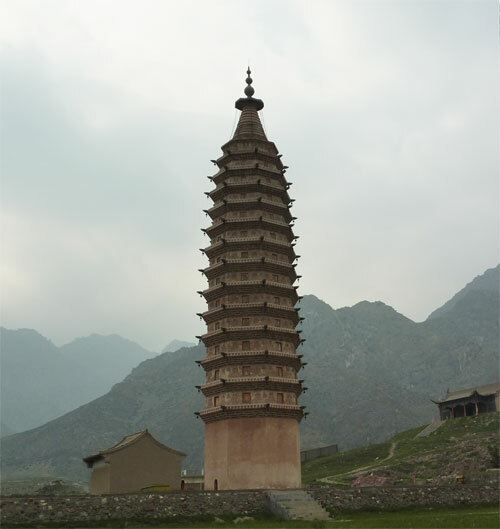 The Pagodas are best visited as part of a combined trip to the Western Tombs, Gunzhongkou and the Helan Shan Rock Carvings by hiring a taxi from Yinchuan (250 Yuan for the day).